Effective communication and teamwork is essential for the delivery of high quality, safe patient care. Communication failures are an extremely common cause of inadvertent patient harm. The complexity of medical care, coupled with the inherent limitations of human performance, make it critically important that clinicians have standardised communication tools, create an environment in which individuals can speak up and express concerns, and share common “critical language” to alert team members to unsafe situations. All too frequently, effective communication is situation or personality dependent. Other high reliability domains, such as commercial aviation, have shown that the adoption of standardised tools and behaviours is a very effective strategy in enhancing teamwork and reducing risk. We describe our ongoing patient safety implementation using this approach within Kaiser Permanente, a non-profit American healthcare system providing care for 8.3 million patients. We describe specific clinical experience in the application of surgical briefings, properties of high reliability perinatal care, the value of critical event training and simulation, and benefits of a standardised communication process in the care of patients transferred from hospitals to skilled nursing facilities. Additionally, lessons learned as to effective techniques in achieving cultural change, evidence of improving the quality of the work environment, practice transfer strategies, critical success factors, and the evolving methods of demonstrating the benefit of such work are described. Communication failures are the leading causes of inadvertent patient harm. Although medical care is delivered by multiple team members, medical quality and safety has historically been structured on the performance of expert, individual practitioners. Effective communication and teamwork have been assumed, and formal training and assessment in these areas has been largely absent. Appreciation that the clinical care environment has become progressively more complex, combined with the inherent limitations of human performance, has spurred interest in applying the lessons of other high reliability industries to medicine. The development and implementation of crew resource management (CRM) in aviation over the last 25 years offers valuable lessons for medical care. Realising that 70% of commercial flight accidents stemmed from communication failures among crew members, CRM sought to standardise communication and teamwork. Currently, CRM is required globally in aviation training, and direct observational studies by Robert Helmreich’s group have correlated actual flight crew performance with attitudes toward teamwork and safety. In 2000, we undertook the adoption of relevant behaviours and skills into high risk medical environments. Twelve clinical teams underwent a three day training programme in human factors; learning about the human factors experience in aviation, and the application of standard tools and behaviours to improve safety and ensure effective communication. The teams each worked on a clinical project in which these techniques could be applied to improve the quality and safety of patient care. The clinical domains represented varied widely from the operating room, the intensive care unit, and continuing care (the transfer of patients from hospitals to skilled nursing facilities), to obstetrics and a cardiac treadmill unit. After the initial training, the clinical teams were supported with site visits and educational sessions for leadership and clinicians within the facilities. Cultural surveys with regard to safety were carried out using the Safety Attitude Questionnaire (SAQ).1 Valuable insights into the climate in these care areas with regard to teamwork, communication, and attitudes toward safety were obtained. Gathering intimate knowledge of the specific culture allowed interventions that focused on the strengths of the team and targeted opportunities for improvement. Monthly conference calls helped create a collaborative community dedicated to improving safety, and to sharing successes and approaches to the inevitable barriers. Our experience has reinforced the belief that simple rules are best for managing complex environments. The tools and concepts that have proven the most valuable are collectively know as SBAR (situation, background, assessment, recommendation): a situational briefing model, appropriate assertion, critical language, and awareness and education regarding the fact that nurses, physicians, and other clinicians are taught to communicate in very different styles. We will discuss these tools and our experiences in optimising successful implementation, and describe experiences in specific clinical areas. Other valuable concepts such as situational awareness and debriefing will be mentioned. Communication failures are the leading cause of inadvertent patient harm. Analysis of 2455 sentinel events reported to the Joint Commission for Hospital Accreditation revealed that the primary root cause in over 70% was communication failure. Reflecting the seriousness of these occurrences, approximately 75% of these patients died.2 All too often, clinicians providing care had very divergent perceptions of what was supposed to happen. Effective communication and teamwork is aimed at creating a common mental model, or “getting everyone in the same movie”. Equally important is creating an environment that feels “safe” to team members so they will speak up when they have safety concerns. The mantra of “everyone in the same movie, and no surprises” is an effective one that is easy to teach. Clinicians understand that surprises in medicine are generally not good. A large and ever present cultural barrier is the deeply embedded belief that quality of care and error free clinical performance are the result of being well trained and trying hard. In this paradigm, inevitable mistakes are viewed as episodes of personal failure, with the predictable result that these events are minimised and not openly discussed. Human factors science tells us that the inherent limitations of human memory, effects of stress and fatigue, the risks associated with distractions and interruptions, and limited ability to multitask ensure that even skilled, experienced providers will make mistakes. As such, effective communication that creates a well understood plan of care greatly reduces the chances of inevitable errors becoming consequential and injuring patients. Briefings, although standard practice in aviation, the military, and law enforcement, have been uncommon in clinical medicine. Spending a few minutes at the beginning of a shift can get everyone at the same startpoint, avoid surprises, and positively affect how the team works together. SBAR is a very effective tool that provides a common and predictable structure to the communication. It can be used in virtually any clinical domain, and has been widely applied in obstetrics, rapid response teams, ambulatory care, the ICU, cardiac arrests, and other areas. SBAR stands for: (i) situation − what is going on with the patient? ; (ii) background − what is the clinical background, or context? ; (iii) assessment − what do I think the problem is? ; and (iv) recommendation − what would I do to correct it? Briefly and concisely, critically important pieces of information have transmitted in a predictable structure. Not only is there familiarity in how people communicate, but the SBAR structure helps develop desired critical thinking skills. The person initiating the communication knows that before they pick up the telephone that they need to provide an assessment of the problem and what they think an appropriate solution is. Their conclusion may not ultimately be the answer, but there is clearly value in defining the situation. Teaching people how to speak up and creating the dynamic where they will express their concerns is a key factor in safety. Frequently, the lack of a common mental model or hierarchy gets in the way. 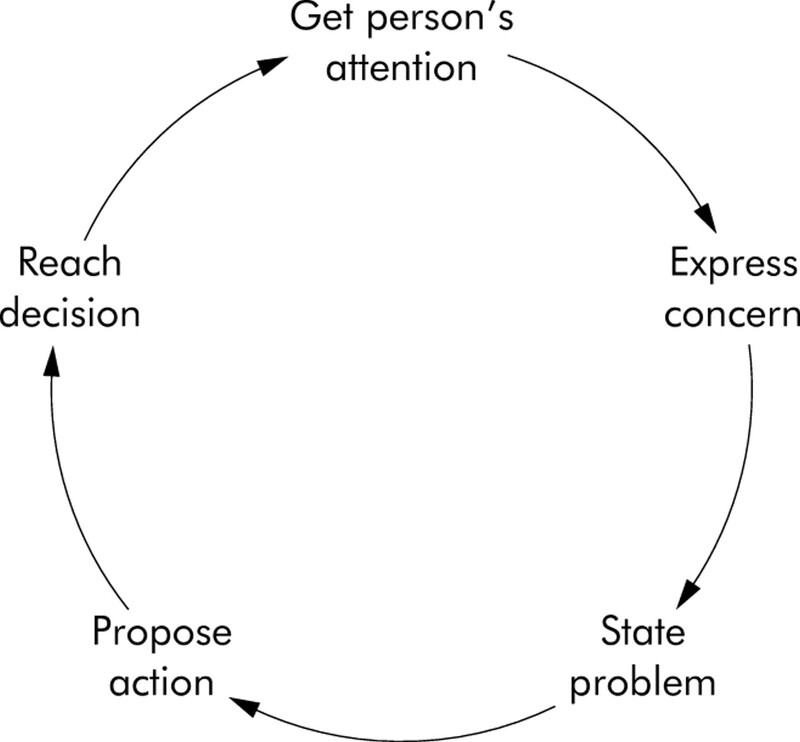 People need to state the problem politely and persistently until they get an answer (fig 1); the common practice of speaking indirectly (the “hint and hope” model) is fraught with risk. Focusing on the problem and avoiding the issue of who’s “right “and who’s “wrong” is quite important and a major success factor. Assertion cycle. This is a model to guide and improve assertion in the interest of patient safety. One point is worth clarification. We often ask or require nurses to provide an objective argument to convince a physician to see a patient. Given the differences in communication style between the two groups, requiring nurses to provide a concise, cogent argument as to the severity of the patient’s condition, and basing the physician’s response time on this, is fraught with hazard. A better approach, and standard practice in our perinatal safety work, is that nurses have license to say: “I need you to come now and see this patient”, and the physician responds every time. The situation is not open to argument at the time that the request is made, particularly at night or at weekends; if the relationship needs to be reassessed, that can be carried out sometime in the future when people can be more objective. Making it acceptable for the nurse to say: “Something’s wrong, I’m not sure what it is, but I need you here now” is an effective mechanism to ensure safety. Coupling this with SBAR helps ensure that communication becomes progressively clearer. In a recent study of medical emergency teams from Australia that demonstrated an in hospital cardiac arrest reduction of 65% through early intervention, the number one criterion to call for help was “a staff member is worried about the patient”.4 There were also numerous objective measures of physiological distress, but the ability of someone to seek prompt and expert help because “it doesn’t feel right” is a very insightful mechanism. Gary Klein’s work in naturalistic decision making has shown that expert individuals rapidly analyse situations by pattern matching against their mental library of prior experience.5 Thus, a nurse at the bedside may not be able to put a concise label or description on what is clinically unfolding, but very probably knows “something is wrong, and I need your help”. Lowering the threshold to obtain help, and treating the request respectfully and legitimately creates a much safer system. Medicine is a hierarchical environment, in which it can be difficult for people to speak up with concerns. Additionally, power distances, lack of psychological safety, cultural norms, and uncertainty as to the plan of action further complicate the situation. The adoption of critical language, derived from the CUS programme at United Airlines, is very effective. CUS stands for “I’m concerned, I’m uncomfortable, this is unsafe, or I’m scared”, and is adopted within the culture as meaning: “we have a serious problem, stop and listen to me”. This ability to get everyone to stop and listen is essential for safe care. Critical language creates a clearly agreed upon communication model, that helps avoid the natural tendency to speak indirectly and deferentially. Catastrophic birth injury is rare in the experience of a single practitioner, and may be a once in a career event. However, a limited number of clinical situations (fetal distress, the need for an emergency caesarean section, shoulder dystocia, placental abruption, and massive maternal haemorrhage) account for a very high percentage of recurrent events.8 Invariably, poor outcomes are accompanied by fundamental communication failures. One scenario that illustrates the importance of effective communication is the “myth of the low risk delivery” (Dr Eric Knox, personal communication). A healthy mother and fetus arrive in labour. If either the mother or the fetus were high risk, everyone would be aware that a potential problem exists. In the case of the low risk parturient, complacency can be very dangerous, because of the attitude of “we’ve done this thousands of times and never had a problem”. In the small percent of these labours that develop a problem, a critical juncture occurs when the nurse has to deal with a physician perceived to be unpleasant or difficult to approach. Reflecting human nature, the nurse will try to correct the problem themselves, and avoid a potentially unpleasant interaction. Most of the time this approach works, but in the case where there is now more of a problem, the next interaction is really critical. When the nurse approaches the physician for help and gets the answer “try these three things and call me in an hour”, the stage is set for a disaster. Kaiser Permanente is the largest, non-profit health system in America, founded over 50 years ago. It is an integrated care model that has 135 000 employees, more than 11 000 physicians, and provides medical care for some 8.3 million patients. In the Kaiser Permanente perinatal work, the practice has been instituted that if a nurse or midwife is concerned, she can say to the physician “I need you now” and they will attend 100% of the time. Teams have standardised the use of SBAR as the model for communication. Additional work has been carried out to define fetal wellbeing, and to have a common approach to the interpretation of fetal heart tracing and practice for emergencies. A good example of standardising response is illustrated by the work of Michael Fox, RN.9 He has adopted a method of fetal heart rate interpretation to enable medical staff such as doctors, nurses, midwives and medical students, to use a common language to optimise the chances of problem recognition. Once fetal distress has been identified, very simple and effective rules are activated: if you see a problem, you have 1 minute to look at by yourself; 2 minutes to look at it with someone else; and by minute three you are physically on your way to correcting the problem. These simple rules provide predictability; they remove the “grey area” of how the nurse or midwife should respond (what’s the urgency, is the doctor busy, should I call him?) − all the potential judgements that contribute to long delays in addressing fetal asphyxia. Not only is the response clear, but everyone knows the rules. Standardised communication at shift changes has been implemented, with doctors and nurses all in the conversation, in contrast to prior practice where physicians and nurses reported to their peers separately and at different times. Briefings using SBAR are used for the team to quickly reassess the if the clinical workload increases or people are getting overloaded: “Let’s talk a minute and go over all the patients on the deck − who’s got what patient, where are we with each patient, what are the issues that need to be addressed, and how do we prioritise?”. Very quickly, the care team can ensure they are all “on the same page of the script” and all relevant clinical issues are being addressed. Critical event training or simulation is a valuable tool. Low fidelity simulation can be carried out by physically walking through the unit and mapping all the tasks that have to be done in the event of an emergency caesarean section: who needs to be called, what resources need to be activated (paediatrics, the nursery), and where is the equipment we will need? Midrange fidelity simulation uses a manikin simulator driven off a laptop computer. The team is challenged with various clinical scenarios and their response is videotaped for debriefing. Trust that the goal is on non-judgmental learning is critically important for credibility of the training process. Focusing on the complexity of the care process and the system flaws that set “good people up to fail” creates psychological safety, which is a key component of learning. Dr Thomas Cuyegkeng and his colleagues at Kaiser Fontana undertook a process to improve the transfer of elderly patients from the hospital to skilled nursing facilities. Commonly, patients arrived at night (owing to available ambulance resources) and the breakdown in communication resulted in important medications such as anticoagulants, antibiotics, analgesics, and psychotropics being unavailable. This is a complex patient population, comprising people who are often frail and taking multiple medications. A common problem with patients arriving with incomplete information at night was that no one familiar with the patient was available to reconcile clinical issues. The Fontana team implemented two checklists; one to be completed in the hospital and one by the skilled nursing facility. This briefing was carried out nurse to nurse over the telephone with the requirement that any gaps or discrepancies be reconciled prior to 5 pm, so people familiar with the patient would be available to help. The team also recharacterised the process and changed it from a discharge to a transfer, to reinforce the concept that the clinicians had an ongoing responsibility to provide accurate information and quality care. A critical forcing function was put into the system: unless the checklist was completed by the transferring physician, the patient could not physically leave. This created a clear incentive for the physicians to get it right, otherwise the patient remained on their service. The result was a dramatic increase in the percentage of patients having necessary medications on arrival in the skilled nursing facility. The following table shows the improvement in providing information in both the hospital and skilled nursing facility (table 1). Another interesting facet was that the process defined the preferred intensity of care (PIC), the conditions under which the patient or their family desired rehospitalisation and what level of care was desired. All too frequently, patients would become ill in the middle of the night or on weekends, when the skilled nursing facility staff coverage is at a minimum, and the chances of the covering physician knowing the patient are least. These chronically ill patients would be sent by ambulance to the nearest emergency department, where they would then receive extensive investigations and/or end up in the intensive care unit; exactly what the patient and their family did not want. By increasing the percentage of patients where the PIC was defined, the team estimated they were saving some 50 unwanted hospital readmissions annually across a patient population of 300 000 patients, and saving patients from being subjected to unwanted medical care. At Orange County Kaiser, surgical teams introduced formalised briefings into their care process. The critical success factors were clear, and there was visible physician leadership and involvement throughout, and an inclusive process that engaged people in the determination of what the briefing content should be. Developing the Orange County briefing tool involved surgeons, anaesthetists, operating room nurses and technicians, and managers, all working together. The briefing categories were broken into four sections. The surgical category began with the surgeon telling the others what he/she thought they needed to know in a given case. It was then everyone else’s turn to tell the surgeon what they needed to know. For example, the operating room (OR) nurses wanted to know if the surgeon was on call, as they would have to answer the surgeon’s pager frequently during the case; the surgeons were visibly surprised to learn how much impact this would have on the nurses during the surgery. Although these people had worked, or physically shared space, for years together, they discovered basic insights into how their behaviour or transfer of information affected others. The briefing chart shown is the third iteration developed by the OR team (fig 2). 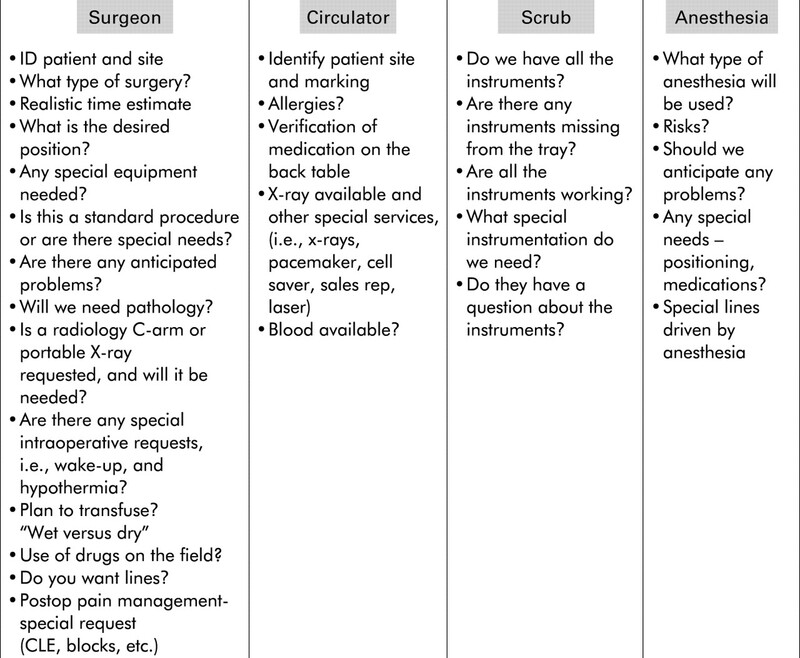 It is a template showing the potential topics for the surgical team to cover, which they use as relevant to the case at hand. The team decided that they would brief after the patient had been anaesthetised, that being the only time they consistently have all members of the team physically present. Other facilities, believing that it is preferable to brief prior to the induction of anaesthesia, have chosen to brief in the operating room with the patient awake. The initial concern that briefing with the patient might infer from this that the team did not know what they were doing has not been borne out; early indications are that patients really like the process. It is presented to the patient as a last opportunity for the surgical team to make sure they are all “on the same page” and doing everything correctly. The Orange County results have been quite positive. Wrong site surgeries, which had been a problem in the past, have not occurred since the briefing process has been initiated. Nursing turnover has fallen by 16%. As measured by the SAQ, employee satisfaction has increased by 19%, and perceptions of safety climate in the OR have gone from “good” to “outstanding”. Significant improvements were also seen in teamwork climate, communication, OR personnel taking responsibility for patient safety, and medical errors being handled appropriately. After implementation, some 80% of OR nurses reported that their input was well received by other team members. The briefing process has been transferred within their hospital to the Departments of Radiology, and Labour and Delivery. Currently, the plan is to now begin looking at the efficiency of the OR and see how preoperative communication failures—that is, last minute surprises where the team finds out that they need particular equipment, people or skills present, are precluded by more effective communication patterns. Through this experience in teamwork and communication training and clinical projects, certain critical success factors have become clear. It is essential to approach medical culture from a “bottom up” perspective. Traditional improvement efforts have been seen as “top down”—that is, “you have a problem that needs to be corrected”. This message will be immediately and vigorously rejected by the culture, which will then actively work against the desired change. A critically important element is to dissociate the inevitable errors and communication failures associated with human performance from the issue of clinical competency. Approaching improvement from the perspective of correcting system flaws and using standardised communication tools to make the day go more smoothly and keep everyone safe is effective. The message of “good people are set up to fail in bad systems—let’s figure out how to keep everyone safe” is readily accepted. Spending time to educate clinicians about the prevalence of system error, and the inherent limitations of human performance, help dissociate error from the common perception of mistakes being episodes of personal failure. Two absolute requirements for successful clinical change are visible support from senior leadership and strong clinical leadership. In medical culture, physicians who stand up and say “this is the right thing to do, I support it and you need to also” have great impact. Others who wait to see if the projects are successful before being publicly associated with them leave nurses and others to push change uphill against the hierarchy; predictably, these efforts are usually less successful. Embedding the changes in the clinical work is essential. The changes need to be perceived as making the day simpler, safer, and easier for everyone. Once the case has been made for change, then having a very clear focus, taking “one bite of the elephant at a time”, getting finite time commitments from the people involved, and measuring and celebrating success are all important components. This work has been approached from the perspective of defining the practical successful elements that can be spread across our larger care system. The perinatal safety and perioperative briefing elements described above are now being actively transferred. Multidisciplinary teams from across the organisation have been brought together for educational sessions interacting with the clinical sites that implemented these tools and behaviours. The teams are then supported with educational materials, site visits, and ongoing collaborative calls as they proceed with implementation. It is our belief that this process accelerates clinical learning and implementation. We have described the experience to date with human factors training focusing on teamwork and communication within a large, non-profit American health system. The experience to date has shown us the value of embedding standardised tools and behaviours into the care process to improve safety in a progressively more complex care environment. Many of the lessons demonstrating the value of such techniques have been learned in other high reliability industries over the last few decades, and they offer a valuable resource for medicine today. Cultural change is at the heart of this quest; transforming care from the culture of the individual expert physician to a truly collaborative team environment. Not only do differences in communication styles between physicians, nurses, and others impede this aim, but the complexity of the care process has made effective communication paramount for safe care. The literature is replete with the frequency and potential devastation of clinical communication failures. For this cultural change to be successful, leadership and physician involvement is critical. Changes need to be embedded in the clinical work, and perceived as providing benefit, not more work to do. Projects need to be clearly focused, so people doing the work can see the benefit of their efforts. This is not a linear process, so flexibility and the ability to adapt to operational pressures and local cultures are important. Communication failures account for the overwhelming majority of unanticipated adverse events in patients. Medical care is extremely complex, and this complexity coupled with inherent human performance limitations, even in skilled, experienced, highly motivated individuals, ensures there will be mistakes. Effective teamwork and communication can help prevent these inevitable mistakes from becoming consequential, and harming patients and providers. Embedding standardised tools and behaviours such as SBAR (a situational briefing model), appropriate assertion, and critical language can greatly enhance safety. These tools can effectively bridge the differences in communication style between nurses, physicians, and others that result from the current educational process. To date, we are seeing that teaching and embedding a few basic tools and behaviours can provide tremendous clinical benefit. We have seen improved cultural measures − attitudes surrounding teamwork and safety climate. As mentioned, these measures have been strongly linked in aviation to actual flight crew performance through direct observation and survey instruments. The development of direct observational markers that assess both task performance and the team behaviours of the clinicians working together is currently in progress. Ultimately, our goal is to show a reduction in adverse events and better clinical outcomes through the adoption of these tools and behaviours. A large integrated system such as Kaiser has the potential to measure infrequent events across a large population, and potentially demonstrate a positive impact on their frequency. Although still early in the journey, this patient safety work shows great promise in both enhancing the safety of care and improving the work environment for our clinicians. We wish to attribute and credit the following individuals for their work in the following areas. Perinatal safety: P Preston, B Merl, S McFerran, J Nunes, J Derrough, R Fields, G Escobar, E Thomas and others; continuing care transfers: T Cuyegkeng, M Rathfelder, S Caulk, A Scott, B Mahoney; and perioperative briefings: J DeFontes, M Gow, M Vanefsky, S Scott, K Dower, S Surbida, L Fuller. Sexton B . Safety Attitude Questionnaire (SAQ). Available at: www.qualityhealthcare.org. Joint Commission on Accreditation of Healthcare Organizations. Sentinel event statistics, June 29, 2004. Available at: www.jcaho.org/accredited+organizations/ambulatory+care/sentinel+events/sentinel+event+statistics.htm. Joint Commission on Accreditation of Healthcare Organizations. National patient safety goals for 2005 and 2004. Available at: www.jcaho.org/accredited+organizations/patient+safety/npsg.htm. Bellamo R , Goldsmith D, Uchino S, et al. A prospective before and after study of a medical emergency team. Med J Australia 2003;179:283–7. Klein G . Sources of power. Cambridge, Mass: MIT Press, 2000. Carthey J , de Leval MR, Reason JT. The human factor in cardiac surgery: errors and near misses in a high technology surgical domain. Ann Thorac Surg2001;72:300–5. Edmondson A , Bohmer R, Pisano G. Speeding up team learning. Harv Business Rev. 2001;Oct :125–32. Knox GE, Simpson KR, Garite TJ. High reliability perinatal units: an approach to the prevention of patient injury and medical malpractice claims. J Healthc Risk Manag1999;19:24–32. Fox M , Kilpatrick S, King T, et al. Fetal heart rate monitoring: interpretation and collaborative management. J Midwifery Women’s Health. 2000;45;498–507.